We have a food emergency among our Italian fans. He’s lost 30 lbs without trying very hard and gives in to the crazing (not a typo) for pasta, but he’s cut down drastically on bread and desserts, so he gets full credit. He’s of Italian background and can’t be expected to never again eat his beloved macaroni. Paul, My husband doesn’t like rice noodles. We’ve tried several varieties and I have to admit, I don’t like them much either, but then, I’m not a pasta fanatic. I’d rather have tomato sauce, known around here as gravy, over plain white rice — to him, it goes against the nature of all things holy. Mamma mia! Tomato sauce over rice – we can do better than that. Man, I miss carbonara, you can’t believe how difficult it is to not eat pasta as an italian! And nobody tell me rice noodles is a substitute! We sympathize with these complaints because it took us a while to figure out how to make rice noodle dishes. At first we struggled: some brands just didn’t taste good, and it was so easy to overcook the delicate noodles into a soft and mal-textured goo. But now that we know what we’re doing, we much prefer rice noodles to wheat. Now when we taste wheat noodles, they seem tough — we don’t miss them a bit. I know it will be hard to persuade our Italian readers that rice noodles are better than wheat … but maybe we can help them enjoy their purgatory a bit better. We especially like this thickness: it cooks evenly but not too quickly. We use about one-third of a bag each time in order to serve four people. There are a few tricks to cooking rice noodles. First, they cook very rapidly – much faster than wheat. And you want them al dente, a little chewy, not soft. So you have to be fast. Bring a pot of water to a boil. When it is actively boiling, add the rice noodles. Cover briefly, until it returns to a boil. Then immediately take the lid off and use chopsticks or some other implement to stir and separate the noodles from each other. Taste the noodles to judge when they are done. They should be chewy, neither soft nor crunchy. Cooking time varies with the thickness of the noodles, but for these it is about seven minutes. As soon as they reach this al dente state, immediately empty the pot through a strainer, return the noodles to the pot, and cover them with cold water momentarily to cool the noodles and stop them from cooking further. Pour them through the strainer again. Now transfer the noodles to a container – we use a wok – and add some olive oil. Coating the noodles in oil will prevent them from sticking together. Mix the oil and noodles thoroughly. These oiled and cooked noodles are ready to eat, but can be stored in the refrigerator if you wish, and re-heated in a microwave for eating. You can prepare the sauce simultaneously with the noodles. 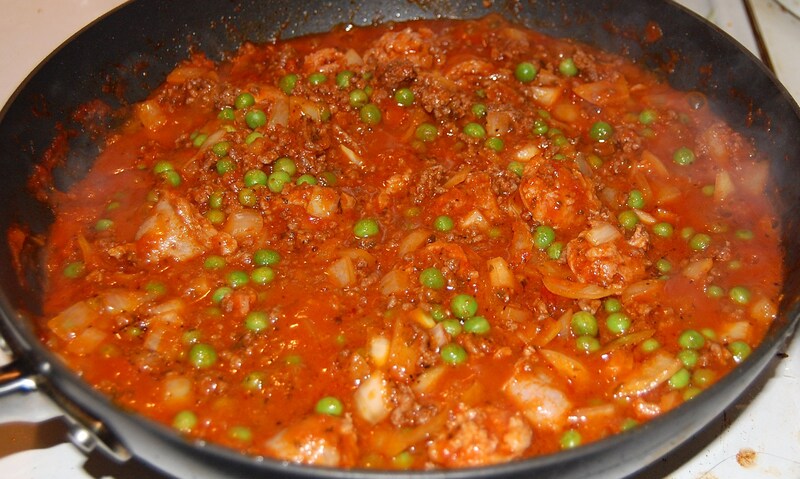 I’m sure everyone is familiar with how to make this sauce, so I’ll just share what we do. 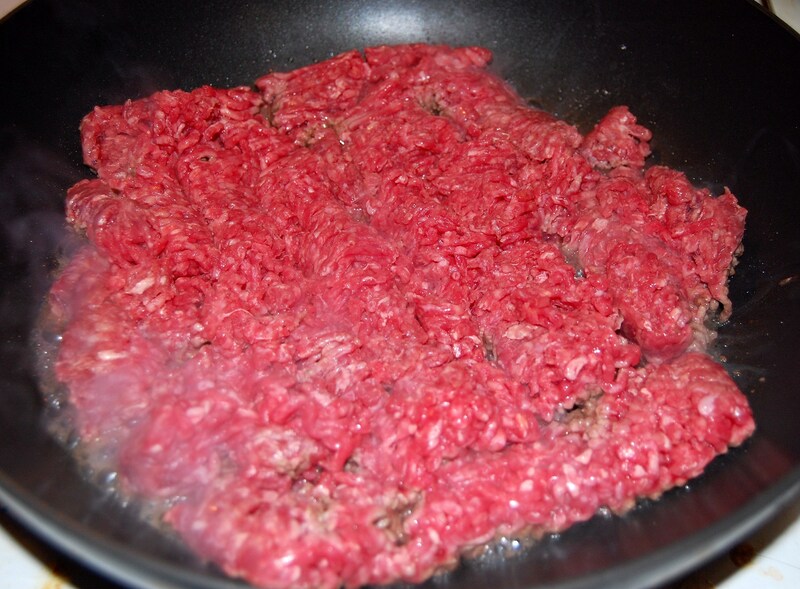 We start by browning some ground beef. We find the natural fat from 80% ground beef provides just the right amount of oil, so we neither add extra cooking oil nor drain away the fats after cooking the beef. 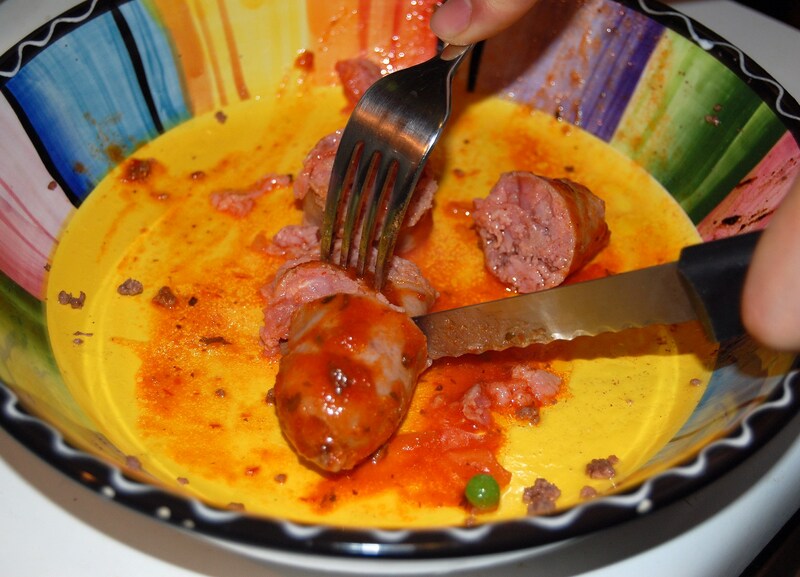 We’ll also include some sweet Italian sausage, to vary the taste a little. 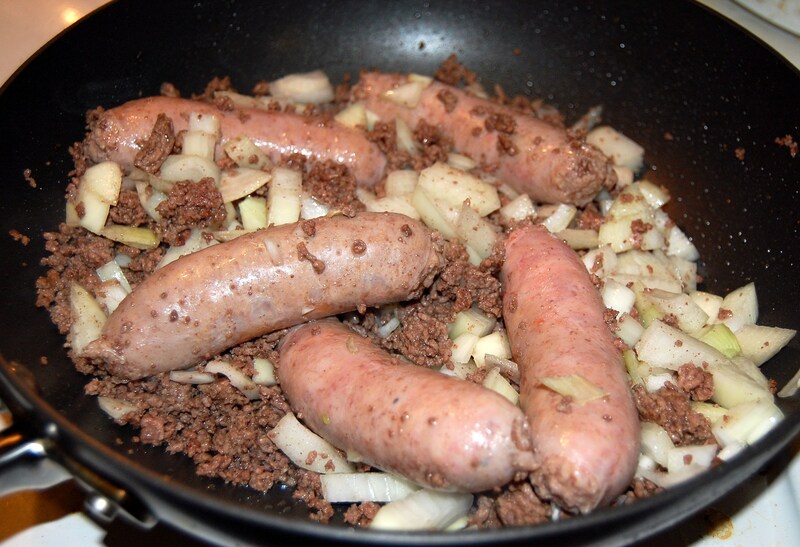 We’ll be slicing the sausage into bite-sized chunks but we find that can be done just as easily after the sausage has cooked a little, so to speed things along we’re throwing the whole sausages into the beef along with some onion. We like to stir-fry the onion about 2 minutes before adding the sauce. The partially cooked sausage slices are then returned to the pot to finish cooking. We also add salt and pepper at this point, and usually (but not tonight) spinach. When the sauce ingredients are well cooked, we add some frozen pre-cooked peas. We stop cooking about 2 minutes after adding the peas. Now just put some of the rice noodles in a bowl and ladle sauce on top. The hot sauce will warm the rice noodles. There you are! An easy spaghetti dinner that, we hope, will please even the Cranky Grouch. Looks fab to me, but I hope somebody’s there to catch Franco when faints after he sees peas in his spaghetti sauce. BTW – why wouldn’t this dish be just as good over plain white rice? We make spaghetti with meatballs without the spaghetti. When you get down to basics what people like is the sauce as the pasta is tasteless and the texture is gummy. So we make all the favorite pasta dishes and just leave out the pasta. Maybe you have to make the sauce a little thicker but it fulfills any pasta craving I have. 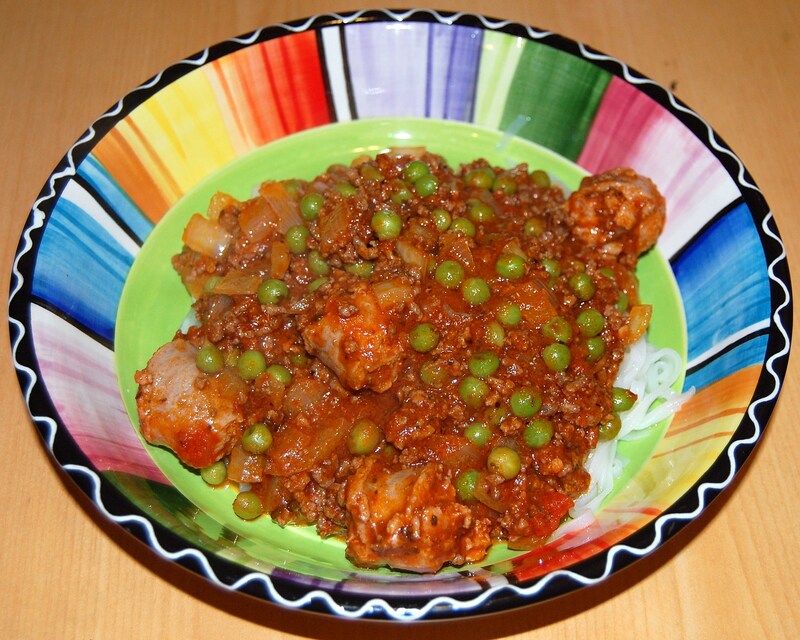 erp – Shou-Ching thinks putting it over white rice is a great idea – it’s a very Asian thing to do, make a tasty sauce and combine it with rice. For me, somehow the softer texture of noodles seems to go with spaghetti sauce. We use shiitake mushrooms, onions, spinach, and peas as spaghetti vegetables. But substitute whatever you like. We welcome suggestions for other vegetables that go well in spaghetti. i agree i wouldnt eat pasta sauce on rice nor would i eat it by itself like jake does. its not about one or the other! Its about pasta AND the sauce! Similarly, I’ve been having my cheeseburgers on a bed of lettuce and tomatoes with slice of raw onion, relish and a dollop of ketchup to top it off. It’s delicious and I don’t miss the bun at all. The CG sends his thanks for recipe and said he will split any royalties from the sale of t-shirts with you. Also says he’ll be available for public appearances and endorsements. BTW, how do I get the rice noodles you’re recommending. BTW2, rice can be soft(er) if you use broth instead of water and add a bunch of butter as well. Yum. Gee, ya think that’s why I’m not losing more weight? I use Mrs. Leepers Corn Spaghetti. It’s wheat free and gluten free, and is made in Italy! IMHO, the texture is more similar to regular pasta than rice noodles. Have you ever tried squash or zucchini noodles? I’ve never tried them but it seems that they would have a pretty neutral taste and closer texture to semolina noodles than rice noodles would. The pictures I’ve seen look pretty good anyway and all you need is a vegetable peeler though it seems a spiralizer (http://www.amazon.com/World-Cuisine-A4982799-Tri-Blade-Vegetable/dp/B0007Y9WHQ/ref=sr_1_1?ie=UTF8&qid=1297044514&sr=8-1) can be helpful if you want to be more elaborate or precise. Butter in rice is great. All Asian supermarkets have rice noodles. Go for the fettucine size or the Pad Thai rice sticks. I’ve added rice noodles to the Amazon links on the Supplement Recommendations page, but if you have an Asian store nearby you might want to experiment with theirs. I’m glad CG is available. We could use a celebrity affiliation. But maybe he should tell us whether he likes the dish first? I wouldn’t want to mislead his fans. Does Mrs Leeper have any that are corn free? That spiralizer looks almost as cool as the Corpus Clock and Chronophage. We haven’t tried squash noodles but we’re intrigued. I realize this is an older post, but hopefully you will read…zucchini noodles are soooo good! Especially in the summer…a lighter spaghetti. In my vegetarian diet days, I made my own puttanesca, a raw puttanesca…again, lovely in the heat of the summer! If you buy a spriralizer, you will love it! I use a spiralizer too. I have found if I dehydrate the zuchinni or spaghetti squash noodles first a little. Then cook them – like in a lasagne casserole, they come out much better. Otherwise too watery sometimes. But I do not have a shortage of recipies for sauces and am (if I might say this about myself) a decent cook. Like I worte, the pasta is the problem and those rice noodles are no substitute (erp’s husband will agree, I’m sure). ( http://en.wikipedia.org/wiki/Risotto ). 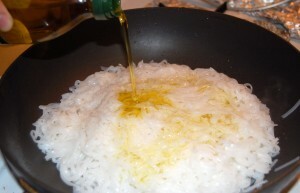 It’s the only rice dish were parmigiano not only fits but is an absolute requirement in most cases. I didn’t try it “carbonara”-style though. Just yesterday had the “risi e bisi” variation (with tomato). Btw, quite THE italian PHD-food which calls for ample saturated fats combines with a safe carb! And it has peas indeed! it might be lost with american italians, but there are quite a few pasta dishes which call for peas in good old italia! 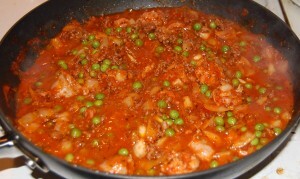 Most famous beeing “pasta al tonno con piselli” (Pasta with thunafish and peas. Kurt Harris posted, I believe, yesterday that 15-20% of calories consumed can be starch…corn being one of the starches. If you live in Italy they are very easy to found in supermarket. I love them! I don’t know if you’ll like them but I can assure you that they are better than any chinese rice noodles I’ve tryed before! I read the minimum amount of order for orders outside Italy is 60,00 Euros, so it is a lot of pasta! If you are planning to do some holiday in Italy you can try them and see if you like their taste. Thanks for the ideas! We’ll have some Italian foods in our cookbook for sure. Let us know your favorites. It sounds like he’s close to our point of view … but I don’t see an endorsement of corn. I don’t think gluten is the only toxin in grains we need to worry about. Thanks for the tip. I’ve sent them an email asking if there’s a vendor here in the U.S. Aside from the cost, and the shipping charges, I don’t know if I’d want a whole carton of rice/pasta on hand especially since I don’t know for sure whether my CG will like it. Both of your English is impressive! My mother-in-law was a great cook. Her ox tail soup was wonderful as were her other meat and vegetable soups and dishes, but her pasta (all pasta was referred to as macaroni in his family) was outstanding. The only Riso Scotti product available at Amazon was elbow macaroni which I ordered. I’ll take a picture and report back on how it measures up when we use it. I happened to see Mrs. Leeper’s on the shelf at Safeway here in SFO not five minutes after reading these comments. “She” also has a brown-rice spaghetti. Re: Kurt Harris, I find his effort to be remarkably (and increasingly) in-line with PHD, which I find particularly pleasing. Kurt and PHD are the only two “diet” resources I have in my Reader, so the more common ground they share the less cognitive dissonance I face. His latest series on macronutrients is well done, and his post on Ketosis (http://www.paleonu.com/panu-weblog/2011/2/6/thoughts-on-ketosis-i.html) ends up with him aligning at around 20% of calories from starch — after numerous VLC experiments. Yes, Kurt is great. I agree with nearly everything he writes. May be just a coincidence, but I’ve noticed a lot of people shifting toward our positions since our e-book came out last summer. Mark Sisson has endorsed “paleo starches” like potatoes, Matt Stone seems sounder in his science now. I think people are converging toward the same diet as they realize that the evidence is actually pretty strong and consistent. We’ve had 10 years of experience with Paleo diets and experience has shown that starches and fats are a good addition to the Cordain Paleo tradition. It’s fun to be part of all this! Paul – I’ve read your book. Love it. One question – In the weight loss section towards the end, you don’t mention ketosis. Is ketosis important to weight loss? Should one be concerned about being in ketosis to effectively lose weight or is following the six steps enough and the weight should slowly come off? I think ketosis is valuable for diabetics, and many diabetics are obese. It’s also valuable for some other afflictions which are more common in the obese. I think ketosis may have some therapeutic value for some kinds of metabolic damage in obesity, but it should be sufficient to induce it occasionally — with occasional ketogenic fast days. It’s not necessary, and I think given the dangers of very low-carb diets not desirable, to be in ketosis all the time. I think obesity is probably multiple conditions which share the feature of weight gain, and so I’m not sure the same program is ideal for everyone. For some people, ketogenic diets might be more helpful than others. But for most people, following the six steps should be the keys for weight loss, and should be sufficient to achieve a normal weight. Hi Paul, just wondering if you’ve heard of this and what you think about it (the obesity section, not the acne section at the beginning)? Thanks, Michael, I missed that. Well, I was strongly influenced by the corn-pellagra connection and by the amazing effectiveness of corn oil at inducing atherosclerosis. There’s some toxin in corn that is very bad, and it hasn’t been identified. Gluten is very good at inducing bad symptoms quickly in celiacs, that’s why it’s so famous and well-studied. But since the dose makes the poison, I would agree that corn in small doses isn’t a big deal. I am looking forward to experimenting with various brands of the rice noodles as well. I agree with you, it’s fun to be part of all this. It’s an exciting time in the healthy diet arena! What about gnocchi (little potato dumplings) with your bolognaise sauce? I had a small serve with my bolognaise sauce for dinner yesterday and they were delicious. You can buy gluten free gnocchi made with potato and rice flour (in Australia) and I’m sure there would be plenty of gluten free options in the US. Great recommendation, GeeBee. When I was a bachelor that was a common meal for me — gnocchi with spaghetti sauce. Now we tend to have Chinese dumplings instead, which you can also get with rice wrappers. Found some brown rice capellini made by Jovial, and it’s from Italy. Trying some! Thank you for the recipe. Just one thing I wanted to confirm. You don’t soak the rice noodles first? All my books on Asian cooking suggest to soak the noodles first until soft and then cook for maybe 30 sec- 1 min. If you’re stir-frying then you need to pre-soak. But if you’re boiling, as we did here, then there’s no need. It absorbs the water during the boiling. thanks, it’s due to the job. And probably because we just write here and do not hear each other. I’m sure I have a quite dominant german accent (was born and raised in germany) whereas I imagine Kratos (as an italian italian:) ) to have a typical italian one which can sound funny. Btw, I had an idea yesterday and experimented with a pasta-substitute from my pancake/crepe pastry, consisting of potato starch, eggs, milk, olive oil(in this case) and salt. I do not have the ratios quite right and the result was great for pancakes/crepe but too soft and spongy for pasta. I think I need less eggs and a bit more starch to make it more pasta-like. I will keep all pasta-lovers here informed when there will be a breakthrough! If you really really really don’t find a suitable pasta-Ersatz, then perhaps you might consider making pasta yourself. First of all, you will know what quality of olive oil is used to make them, which is not unimportant. Second, you can use wheat from a reliable source (may be difficult to find but not impossible), sprout it first, let it dry after it has sprouted and grind it yourself. There are several mills on the market to grind your own grains. The soaking would eliminate part of the phytates (or even all of them?) and may make your pasta more “acceptable”. Also, making your own pasta, would give you a possibility to experiment with grains that contain less gluten, or none at all. It would also be an idea to try and find a mix of ground wheat and ground rice. I hear that kneading the pasta-dough is a bit of a tough job, but if you are a sturdy German man, it shouldn’t be such an extreme problem. If it is though, there are bread baking machines with a program to make your own pasta dough. Joking aside, the target is to find a pasta-like food without using “unsafe” grains/gluten whatsoever. Please post your pancake recipe … and I don’t think people with accents sound funny. I grew up in New York with immigrants from various countries and they all had a good sense of humor about their different ways. A little humor and tolerance goes a long way. I can (and do) lough about myself quite a lot, that’s why I reserve the right to laugh about others if it seems fit. I remember when my father (from sicily and after he was in germany for two decades already) finally learned to pronounce a german “h” (same like in english, e.g.”house”) which italian doesn’t use and started to put it arbitrarely on german words were actually was none! It was so funny and often when it did happen I looked at him smirking and then he understood and we both had to laugh! Self-humor but tolerance as well was something I learned from him. Most of my german relatives were a bit stiff in that regard those times. I’ll post the pancake recipy in the recipy blog. Good natured laughing is different than laughing at others expense. I worked at a school where eight different languages were taught. The faculty were all native speakers whose English wasn’t always very good, so there was always plenty of laughter since I spoke only English and we often resorted to pantomine when no bilinguals were available. I’ll leave you to guess which faculty was the most harshly critical of the accents of their students and were the least able to pronounce English words correctly themselves. It really was all really great fun. You’re lucky to have a Sicilian father. My father-in-law was of Sicilian background and a stronger more caring person would be hard to find. Nothing ever fazed him. He was looked down upon by his Neapolitan in-laws, yet he supported them all and never had a harsh word for any of them. After some research, it seems that the brown rice pasta may not be the correct choice. Am I correct? P.S. 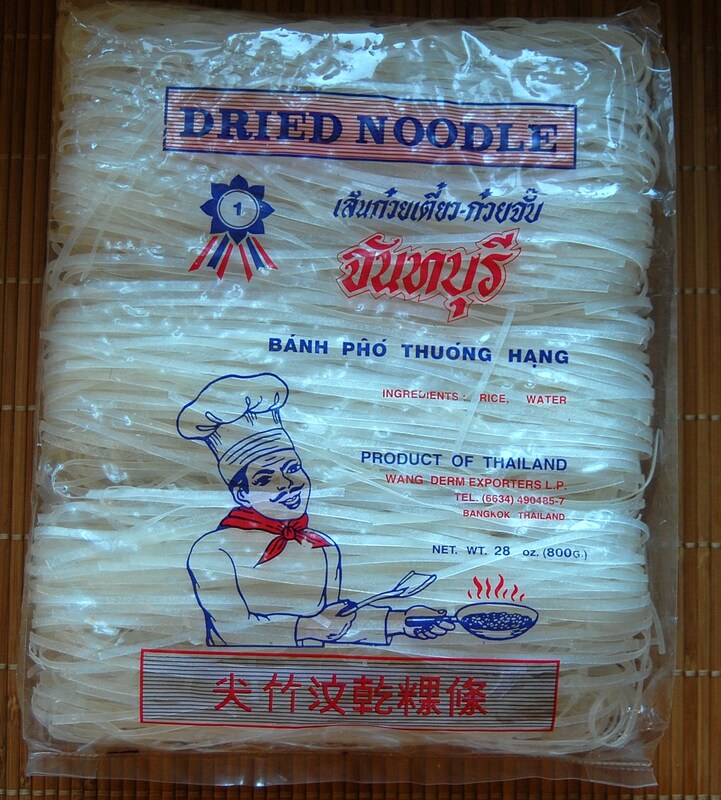 I have a friend who can get me some of the Thai rice noodles that you recommend, and I’m looking forward to trying them. Please let me know if you experiment with the corn pasta. We haven’t tried brown rice pasta so I don’t know how it tastes … if you’re asking about health, I think the white rice noodles are better but brown rice should be OK. Better than corn. I just tried Tinkyada white rice spaghetti and it’s really good! Tastes almost like wheat. Yummy!! It’s not mushy. But you really have to rinse them after you cook just as they say in the instructions. The best part its ingredients: stoneground white rice and water! That’s it! I think I much prefer this to the Asian noodles where I don’t really know where they come from, what’s in them and how they were made. And I’m proud to say it’s made here in Canada, but it’s available in the US as well. I was told you can buy it many grocery stores (gluten-free section), Whole Foods, and health food stores. Thanks, Mia! We’ll look into that one. I’ve been having a field day shopping at my local Asian market for all sorts of stuff – now I just have to use it! For the lower carbers, these have about 1/2-2/3rds the carb content of rice noodles. I made a vermicelli tuna noodle dish which was nothing to write home about lookswise but tasted fine. I like these way better than shiritaki noodles for texture, and if I ever go lower carb again, I’ll “eat” these carbs to have some noodles! Paul, what’s your opinion (safety wise) of the “green bean” noodles? I looked at a few brands and it’s apparently not string bean starch but green mung beans. One I bought also had peas which I know you think are OK.
Oops, 2nd paragraph should have come after the third. Those green bean noodles have fewer carbs than rice noodles. But since I’m making another post, thanks Mia for the info! The mung beans are extremely popular in Asia, but I’m suspicious of them. Their safety profile is probably similar to lentils and chickpeas. If they’re soaked and cooked they’re probably not that dangerous. In noodles is probably one of the safer ways to eat them. We eat Tinkyada brown rice pasta — I didn’t even know they had white rice pasta because I’ve never seen it at the store. But seriously, it’s the best rice pasta I’ve ever had. 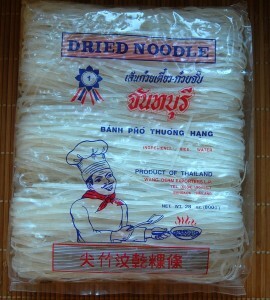 I like Thai noodles for Thai dishes, but they seem too “fragile” for spaghetti sauce with meat. I’ll try them though. And I will definitely look for white rice Tinkyada! And, by the way, Mia, if you read this, the brown rice Tinkyada is FABULOUS. I made my daughter penne Tinkyada with tomato sauce and parmesan for dinner and she loved it. She didn’t eat it all, so I had a couple bites. It has the same good texture as semolina. Not mushy, sticky, etc. I made my husband a crab pasta salad with it the other day and he kept saying how he couldn’t believe it wasn’t regular pasta (he was just diagnosed with allergies to wheat and casein 2 weeks ago — a big shock that his blood tests came back postitive). My guess as to why almost all of their pastas are brown rice is that it “holds up” better. I figure if I eat it once a week, I’m not going to worry about any of the bad stuff in brown rice. It’s so much better for you than wheat and the texture is terrific. First rice pasta I’ve been able to re-heat without it turning into complete mush.